Whether you're looking for tips to grill burgers or you want to know how to cook burgers on the stove, we've got the must-have tips and tricks you need to achieve perfect burgers with juicy, flavorful meat every time. If you want to discover the easiest ways to make the best burgers, check out our primer on How to Cook a Burger and we promise your gang will be wowed! When it comes to building the best burger, you want to make sure you start with the best burger meat, so you'll want to avoid frozen or extra-lean meat when possible. 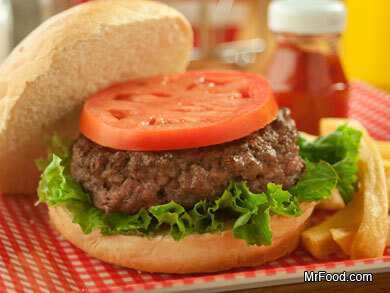 For a juicy burger we recommend choosing ground beef that is 80 percent lean and 20 percent fat (80/20). The most important burger tip we can give you: Don’t overwork the meat! Be extremely gentle when you handle and form into patties. If you press too hard, you’ll run the risk of tough burgers. If you’re adding mix-ins or seasoning, you can try using a fork to gently mix rather than your fingers, which tend to apply more pressure. If you like those perfectly round-shaped burger patties, then you can easily make them at home by using a large lid (like the one on your mayo bottle) and covering it in plastic wrap. Just lightly press the patty into the lid and pull up on the plastic wrap to remove. 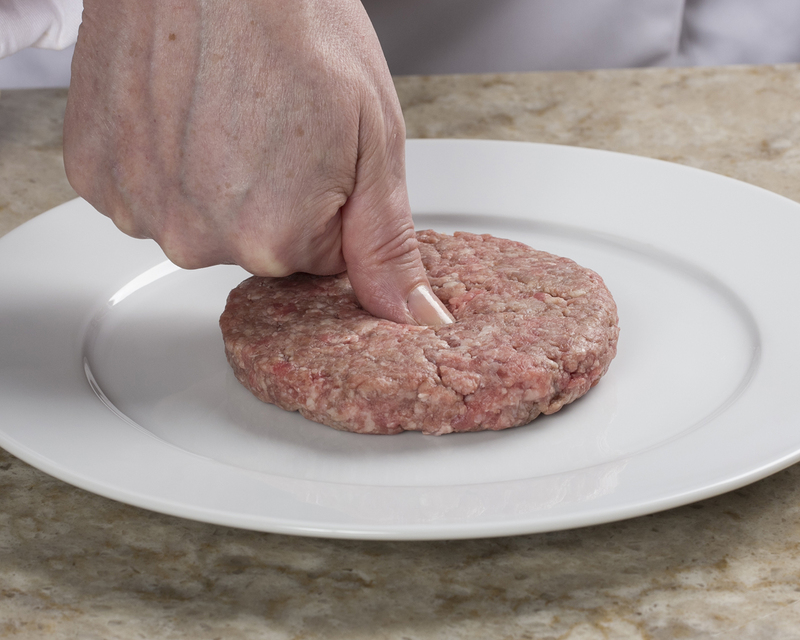 Using your thumb, lightly press down into the center of your burger to create a "dimple." Adding a dimple prevents your burgers from puffing up while cooking, making it easier to put your toppings on later! Don’t skimp on the salt and pepper. Meat especially needs salt to bring out its flavor. We recommend about ½ teaspoon of each, per pound of meat. 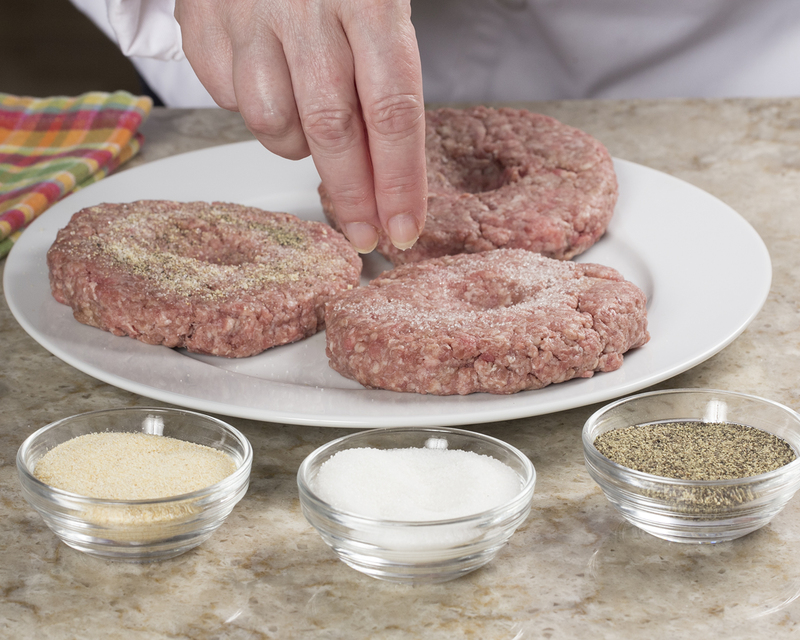 One of our favorite ways to prepare burgers is actually the simplest: Don’t mix anything into the meat! Instead, very gently form the meat into loose patties and generously season each side with salt and pepper. This always gives us the most mouthwatering burgers! If you prefer to add seasonings inside and out, try using BBQ sauce, herbs, spices, your favorite shredded cheese, or minced garlic to your burgers to add serious flavor fast! Try stuffing your meat with cheese. Take two small patties and slightly flatten them. Place a piece of cheese on top on one patty, then top with the other. 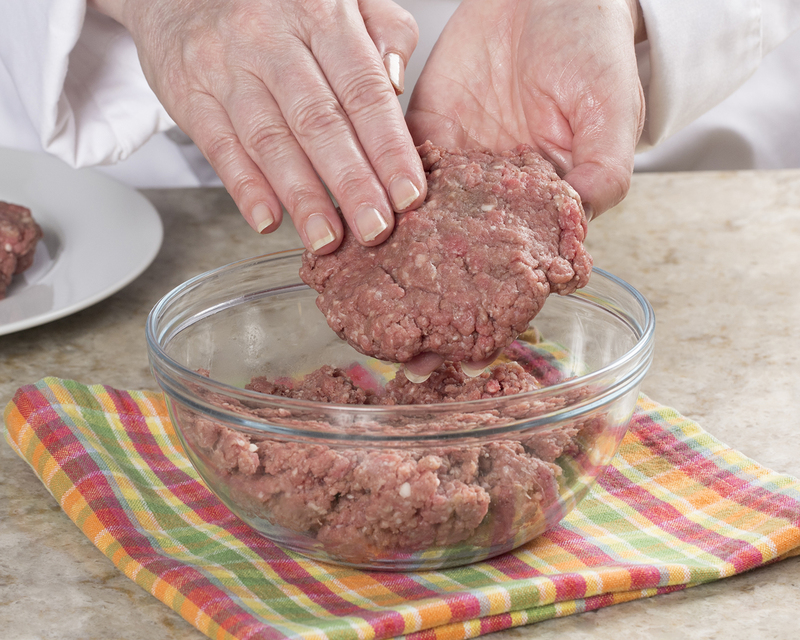 Lightly press the edges of the patties together so that you end up with one, big cheese-stuffed patty. Add some international flair to your burgers. We love our American-style burgers, but why not try a Mexican version, with salsa and jalapeno cheese? Or how about an Italian burger, topped with pepperoni, tomato sauce, and mozzarella? The possibilities are endless! 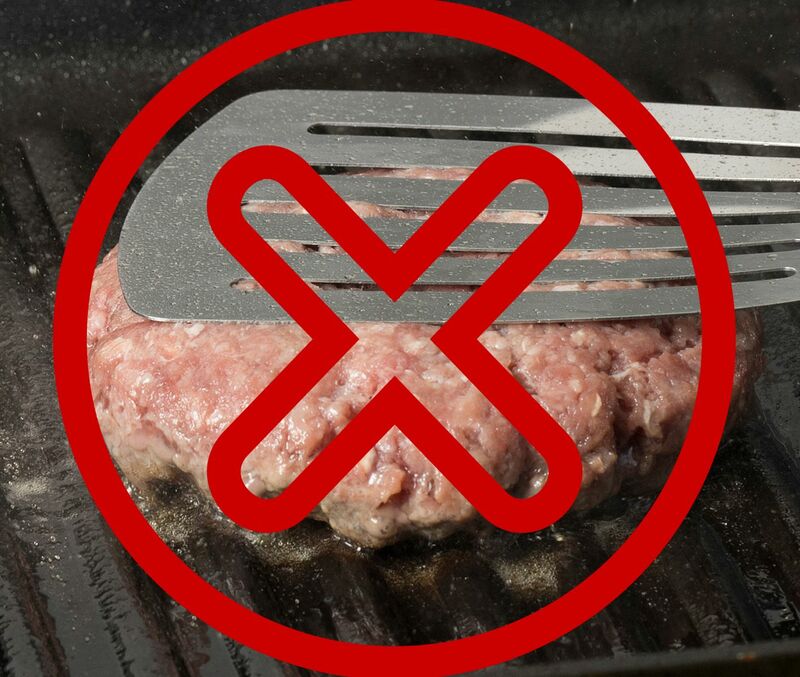 Allow your grill, stove, or oven to get nice and hot before you throw your burgers on. This will get a nice, crusty sear on the outside of the meat, which means it’ll be loaded with flavor! A burger only needs to be flipped one time as it cooks, whether you’re grilling or cooking on the stovetop. This ensures that the burger cooks evenly, and it also means you won’t lose as much juice and flavor. Resist the urge to use your spatula to push down on the patties as they’re cooking. This will only squeeze out all of their delicious juices – we want to keep those in the burgers! According to the USDA, ground beef should be cooked to a minimum internal temperature of 160 °F (71.1 °C) as measured with a food thermometer. Doing this will destroy harmful bacteria and prevent food poisoning. Now that you've learned how to cook a burger, why not practice your skills with one of the delicious burger recipes in our collection, Our Best Burger Recipes: 20 Simple Hamburger Recipes You've Gotta Try. Of course, there's more to the world of burgers than just ground beef. We love experimenting with pork or veal burgers, or you can try using ground turkey for a leaner sandwich. How about giving salmon burgers a try? Hmmm. This should've been called how to prepare meat for burgers, not "how to cool a burger." I always put a couple fingerholes near the center to the patties...keeps them from shrinking. I like my patties more flat..not so thick. Probably wouldn't work with thick ones. Bobby Fley makes a dimple in the middle of the burger to keep the burgers from cupping.